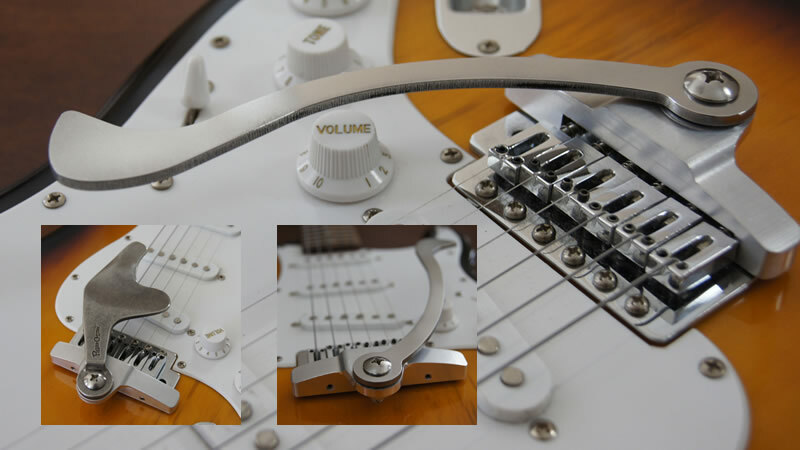 San Diego, CA – May 24, 2016 – (GuitarPR) – Tremolution, the manufacturer of the unique contoured tremolo arm, Palm-O-Low, has just announced the new Trem-O-dapter, a versatile, patented bridge adapter that quickly attaches to vintage style bridges, creating a mounting platform for a variety of tremolo arms, including the Palm-O-Low. Trem-O-dapter looks great, sounds great, and is a fraction of the cost of a new bridge. The adapter’s center pivot point keeps chords in tune, and it includes a spring mechanism, placing light tension on the arm to hold it in place. It can even be used in conjunction with the standard round tremolo bar. Easy to install, Trem-O-dapter simply slips over the back of your “floating” tremolo bridge. Tighten the two screws firmly with the included hex wrench and that’s it. It’s ready to play. You can view and listen to the Trem-O-dapter in action on their demo video at http://youtu.be/rGBRxXuX3KE. The new Trem-O-dapter is available in several configurations directly from Tremolution on their website at http://tremolution.com.